Dr. Seuss turns 50 simple words into magic in this time-honored classic. Sam-I-am won't give up! 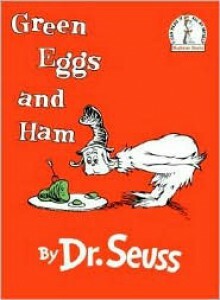 He keeps trying to get the grumpy grown-up in the story to taste green eggs and ham. No matter how Sam-I-am presents the green eggs and ham (in a box, with a fox, in the rain, on a train), the curmudgeon refuses to try them. Finally, Sam-I-am's pesky persistence pays off. A crowd of open-mouthed onlookers watch in suspense as the old grouch takes a bite. And?...SAY! The old sourpuss's face is wreathed in smiles as he gratefully acknowledges, "I do so like green eggs and ham. Thank you, thank you, Sam-I-am!"